The Prohibition may be nothing more than a dusky lesson in history for many, but for mixologists at The Mill House it’s the inspiration behind one of their most provocative pours. And this ain’t no bathtub gin either, crusader: La Próxima Palabra takes the down-and-dirty Detroit classic and gives it a modern Maui spin. Alright, so admittedly, one day on Maui isn't enough. But is any length of time ever really enough on Maui? Exactly. Millions of people from around the globe visit Maui each year, but a portion of those are only able to visit for a single day, often due to cruise ship time constraints, work trips, or simply a quick island-hopping excursion. Having eaten at many restaurants on Maui my husband and I were beyond excited when we heard about a new 7-course tasting menu at the Mill House Restaurant at the Maui Tropical Plantation. My husband; a trained chef out of San Francisco was eager to say the least to see what Chef Jeff Scheer and his staff had up their sleeves. After settling in with a glass of wine, out came the amuse-bouche. A foie gras torchon served on a crostini with fennel jam. My first time trying foie gras and it did not disappoint. What an incredible bite! Rich and smooth with the perfect balance of salt and sweet. Next up our first course. Uku (snapper) ceviche lying on a bed of Ulu (Hawaiian breadfruit) that was pureed and creamy with richness similar to cheese. On top of the Uku was a fresh slice of orange and a fragrant mint leaf. When this dish was placed in front of me, my first thought was that it smelled like a fresh garden! This rang true the whole evening as all the ingredients used are from the gardens that surrounded us or from farms all local on Maui. Such a bright bite of food with so many flavors it truly woke up our pallet for more to come. Second course honored the fresh vegetables grown on property. Bright red tomato and fresh green beans sitting on top of sous vide tuna belly. A perfectly soft-boiled egg with a creamy sauce that had a burst of lemon balanced the bite out beyond belief! Third course was head cheese. This was also something new for me to try and I was pleasantly surprised. Braised in sherry vinaigrette with a house made mustard and topped with a jalapeno, honey and strawberry compote the combination of flavors worked so well. Tart from the vinaigrette and sweet strawberry and honey along the slightly spicy jalapenos made the head cheese a bite I will never forget. I honestly wasn’t expecting to enjoy this course as much as I did. Forth course was a poblano sausage in fresh made agnolotti (pasta). Topped with corn, basil and crunchy onions. The sauce made you wish you had a slice of bread to sop it all up with or maybe just lick the bowl if no one was looking! Seriously. We were amongst friends at our table by this point and a few were guilty of drinking the sauce like a 3 year old drinking their milk out of their cereal bowl. Delicious. Fifth course poached Kalekale (snapper) in a lobster and shrimp stock topped with fennel and tomato. The acid and tang of the tomato balanced the delicate smooth fish to make the bite complete. Next up as our sixth course was a pork chop with fermented garlic, chayote, smoked crème fraiche and pickled ali’i mushroom from the Big Island. The mushroom in this dish was the star. It had been marinated in vinaigrette and the tartness really worked well with the pork. Again balance. This seemed to be the most common word my husband and I used to explain our dinner throughout the night. The chef’s ability to balance each bite with just the right amount of acid, savory and sweet. Perfection! Last but not least was dessert- the seventh course. Rosemary cream with ice cream and a freshly baked slice of banana bread. Almond brittle and a slice of banana on the side. Never before did I think rosemary could be incorporated into dessert but after this course I realized that yes it sure can! The crunch of the crust of the banana bread and the silky rosemary cream were magic together. I came into this evening not knowing what to expect. No idea of what the menu would entail or what surprise would be in store. We love food. We love good food. More importantly we love well-balanced, locally sourced food that is made with love. I believe that the best spice in food is love and you can truly tell that Chef Scheer loves what he does and respects the food that he has the pleasure of working with for these intimate yet casual chefs table dinners. The balance he can create with flavors is a talent hard to find. The chatter grew amongst the tables with every plate that came out about every ingredient and how thoughtfully placed it was in each dish. He invited us all joining him for dinner to walk around and watch his love and passion being plated and was happy to answer any question with a smile. It has been a long time since I was ‘wowed’ by a dinner experience. Maui Chef’s Table is a unique experience and we were ‘wowed’. One made for those that enjoy a culinary journey. Those that have a desire to inhale the aroma coming off the plate just set in front of you and to try to deconstruct the ingredients based on that smell. Three words seem encompass the whole night… Fresh Balanced and Love. I know where I’ll be next weekend. 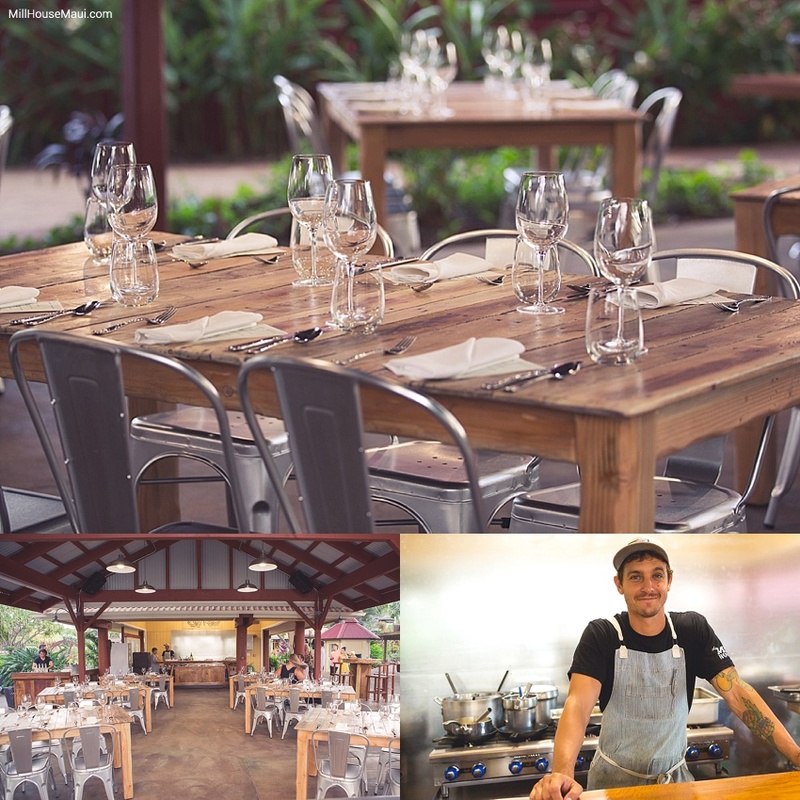 Maui Chef's Table Tickets are still available! tell us about your chef's table experience. Comment Below!